Bed Covers can sometimes be made of a quilt, comforter or a blanket, depending on the place where you are using it. The bed cover’s purpose is to protect the mattress directly and can even be used as a comforter to cover one’s self in the night. Bed covers are also used for decorative purposes to give the bed a more aesthetic appeal. Some covers can be used, such as the comforter or quilt mentioned above, while others are removed prior to sleeping in the bed. 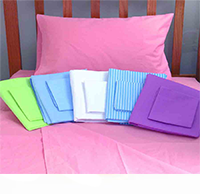 Some people also use the second sheet with the fitted sheet above the comforter or quilt as a bed cover, which can be removed when sleeping. Our collection is available in the best synchrony of colors and designs. Our cotton bed linen/cotton bed cover are best suited to make bedrooms creative and decorative at the same time. Choose from a wide variety of bed sets in various sizes and with exclusive designs only from Cherfan draperies.Quality ranges from Ploy-cotton sateen made from the finest materials. © 2019 Cherfan Draperies S.A.R.L. All Rights Reserved.